Location: Castle Park in Bangor, Northern Ireland. 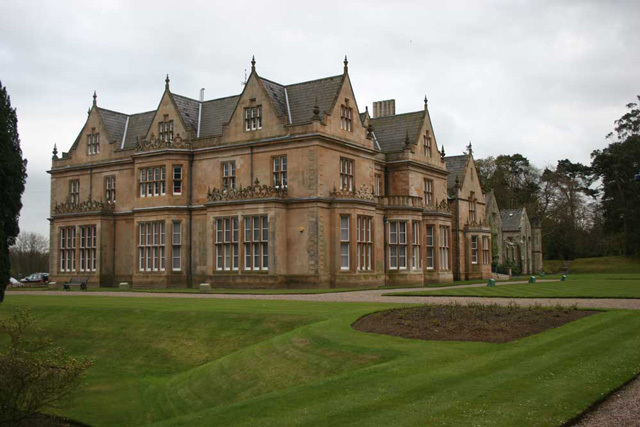 Notes: Bangor Castle is a country house situated in Castle Park in Bangor, Northern Ireland. It is now the offices of the local council. This imposing building is an elegant mansion in the Elizabethan-Jacobean revival style, with 35 bedrooms and incorporating a huge salon for musical recitals. It is attached to a previous abbey building which had been occupied by Franciscan monks until the Dissolution of the Monasteries in 1542. The gardens, designed by the Ward family in the 1840s, have won many awards for their outstanding blooms and are open to the public. The building also hosts a museum to the Ward and Bingham families, which includes the Victoria Cross awarded to Commander The Hon. Edward Bingham, son of the 5th Lord Clanmorris. "Irish Castles- Bangor Castle". Retrieved 23 October 2013.